The New Revolution in Mentalism is HERE! Combined with a specially designed sensor board, the ThoughtCast lets you see anything your audience member writes or draws from across the room. Just slip the board into a standard folio pad, put the included ring magnet on or inside any pen, pencil, whiteboard or permanent marker, and ThoughtCast does the rest! ThoughtCast scales your spectators drawing and displays it in a way that is easy to read, making this the perfect tool for mentalists. Also included with ThoughtCast are several different modes, including Touch to Peek, Fully Customizable Zone Mode, and Timer Mode. 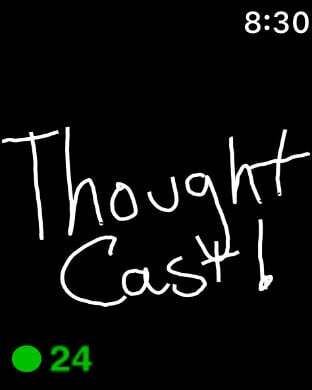 All of our modes are described in detail at thoughtcastapp.com! Plus, with an additional purchase, you can even receive your spectators drawing onto your Apple Watch, with the help of our built in Watch Mode! For hardware availability, and if you have any other questions, please visit thoughtcastapp.com for all the information!